Now that we have performed sample-level QC, we can plot our CNV calls, along with the relevant evidence. 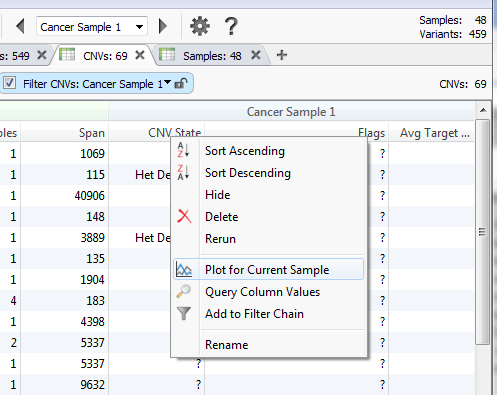 Select CNVs from the dropdown above the currently open table. While this table provides many useful pieces of information associated with the CNV calls, plotting the CNV data associated can be helpful when performing analysis. Before plotting, though, the CNV State column can be queried to exclude missing values. This is done by right clicking on the CNV State column header and select Query Column Values. This opens up a filter tag in the title header. Here, click on the question mark to present options for the query. Checking all of the options here will keep them in the column, and then remove any missing values. The selection of all options (which are ‘Het Deletion’ and ‘Duplicate’ in this example). 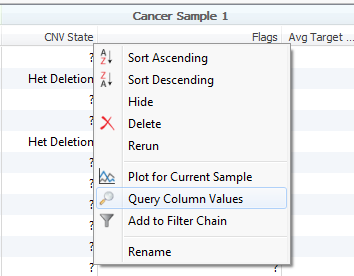 The selected options will now appear in the query filter in the header, and clicking anywhere on the screen not on the value query selection window will set the currently selected configuration and close the window. 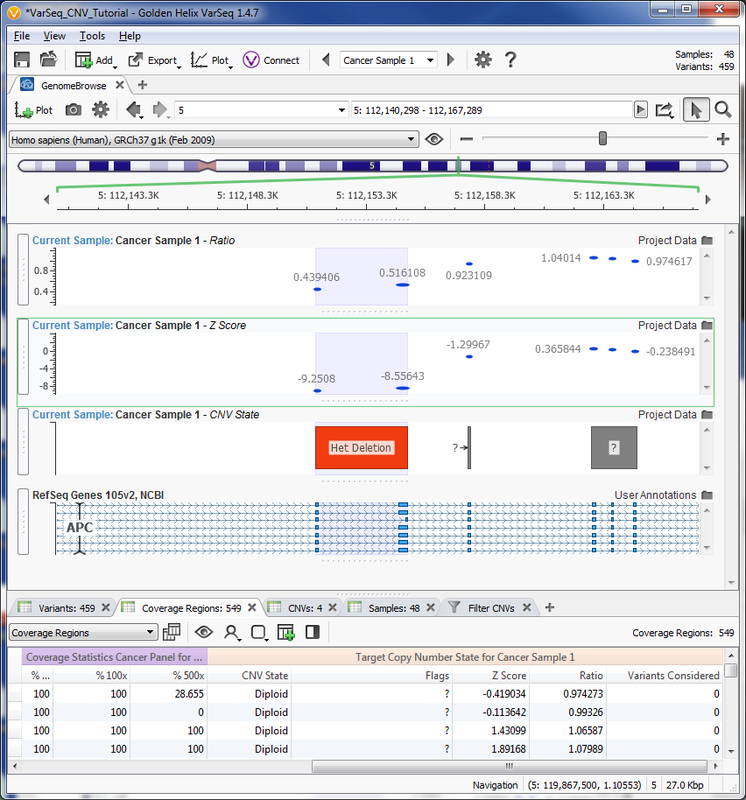 This will open a GenomeBrowse view containing the CNV State of the current sample plotted along side the gene track. 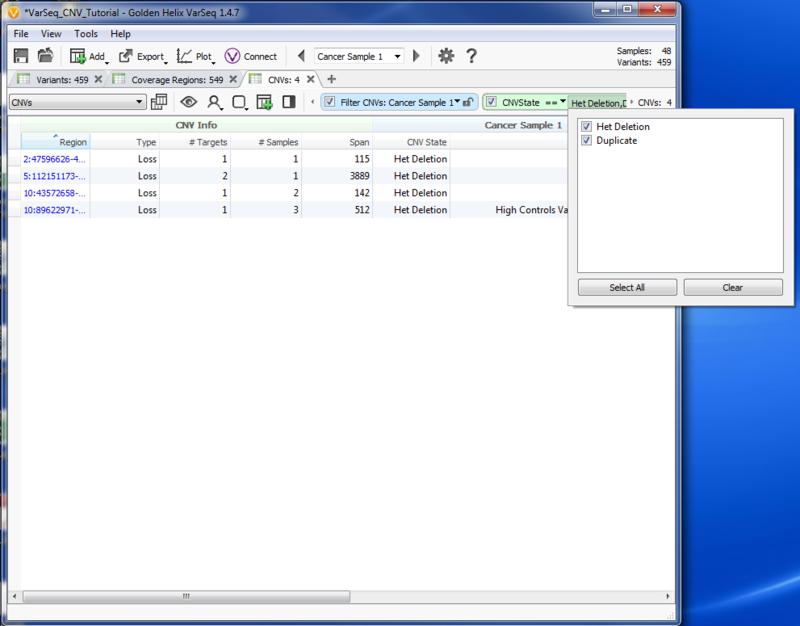 Open the coverage table by selecting Coverage Regions from the table selection menu. 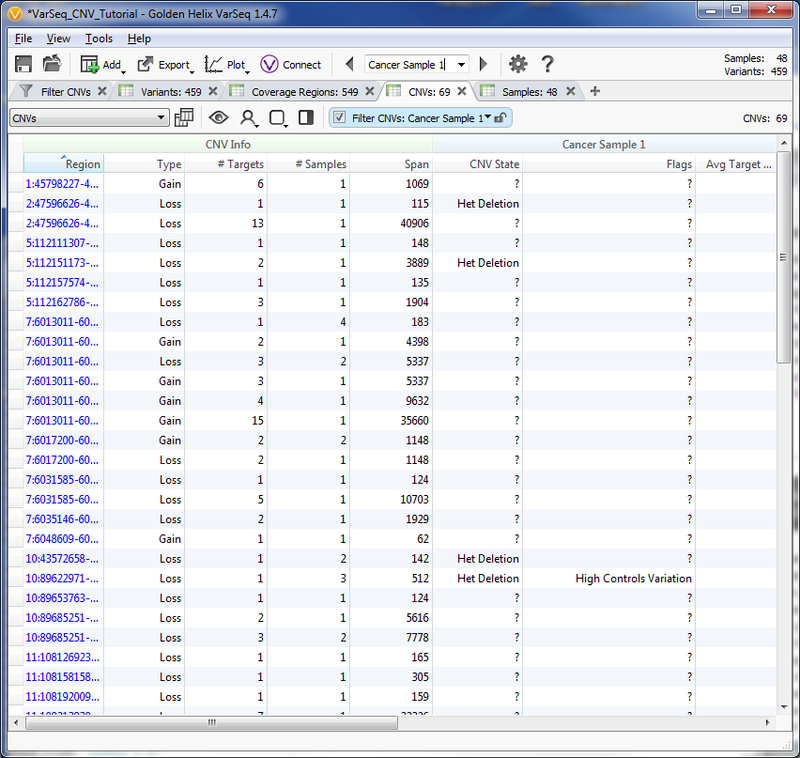 This table contains the CNV data associated with each target region. 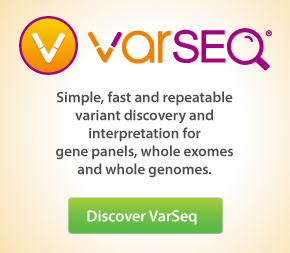 This includes the regional CNV state, QC flags, Ratio, Z-score, and the number of variants for which VAF was considered. The two primary pieces of evidence used to call CNVs are the Z-score and Ratio. 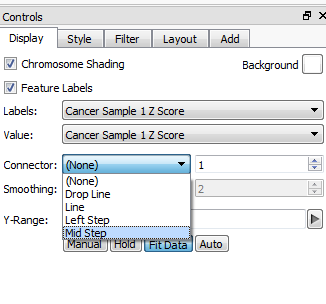 Right click on the Z-score column, then select Plot for Current Sample. Then, right click on the Ratio column, then select Plot for Current Sample. 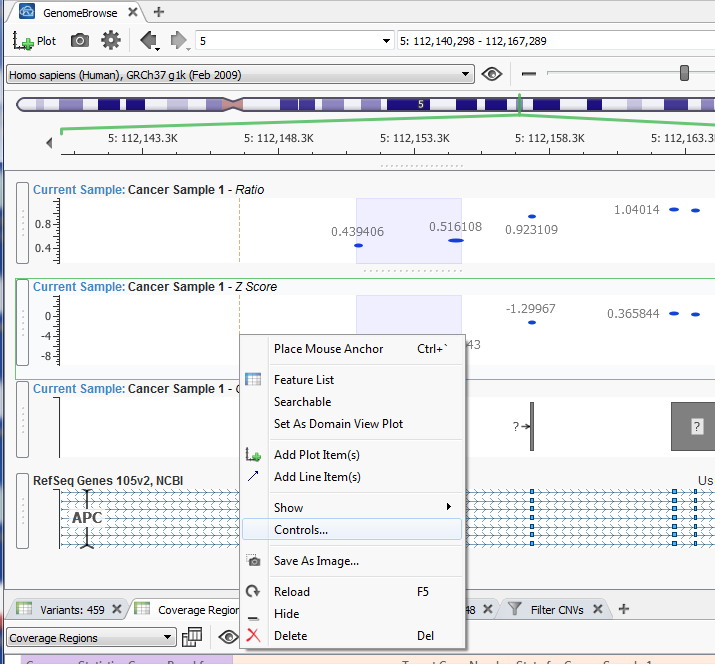 GenomeBrowse provides a number of controls that can be used to customize the appearance of the plots. We will use these controls to add a mid step connector to our Ratio and Z-score plots. 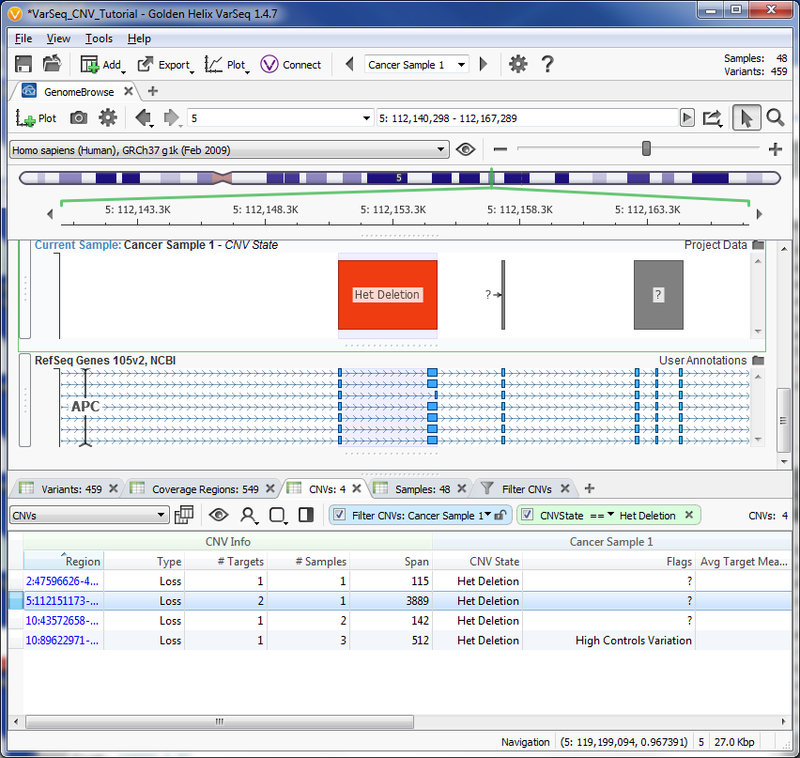 Click the dropdown labeled Connector and select Mid step. 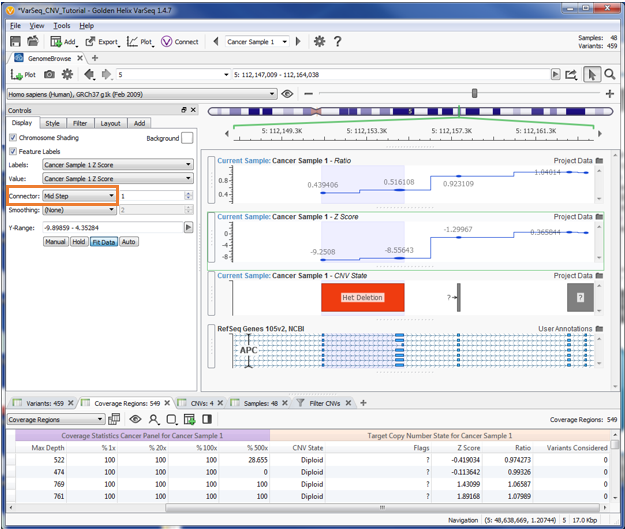 This will add a mid step connector to the currently selected plot. Repeat these steps for the Ratio plot.